Disclaimer: I was given a free advance ecopy of this book via NetGalley from the publisher, Angry Robot Books in exchange for an honest review. My opinion remains as forthright as ever. What to expect from this book: lush descriptions, an unusual world built of sinister fae politics and human religion, and rather sluggish pacing for the first half of the book. I would blame the pacing on some of the Gothic elements of the novel, along with an excess of introspection on the heroine's part- Cathy is isolated in a spooky mansion where she is warned not to leave. Her brother, Laon, is away, but none of her fae companions will tell her why or where. Cathy's unanswered questions lead her to investigate on her own and at the beginning she's fairly slow, leading to a slower start to this book than I expected. Arcadia, the land of the fae, has a lot of unexplained rules for humans to follow, and the main one is humans need to salt their food. Cathy is unsure whether some rules are just taboos or not, so she's careful to follow the advice of Mr. Benjamin and her companion the changeling of Miss Davenport. This stalls many of her investigations, leading me to become a bit frustrated. Cathy as a character is overcautious, which adds to the slower pace. It's somewhat understandable, given the timeframe this book was set in, but I tend to prefer my heroines foolhardy. By the time Laon shows up, you'd think the plot would move a bit more quickly, but there are still questions going unanswered and little for the reader to infer on. Those who prefer their books religion free may want to skip this one, as Mr. Benjamin, the single fae convert to Christianity, has many questions that Cathy and Laon find difficult to answer. Most of the fae are focused on trying to get the missionary (Laon) to trip up on his faith and prove it invalid. Cathy and her brother are trying to figure out what happened to the previous missionary that came to Gethsemane by decoding his journals. In summary, there are many plot points with this book, but most of them are passive rather than active- a battle of wills and wits rather than sword and fist. I was expecting a little more of the latter, but of course I am on a rather action-packed detective novel kick at the moment. Victorian elements flavor the fae and fantasy elements of this book, a fact which I do appreciate as a Victorian soul. But due to the mostly passive plot points, this book still took me much longer to read through than most books with 400 pages. Under the Pendulum Sun is an intricate distortion of myth and history that somehow results in a romance. I was a bit baffled by some of the turns of events in this book, but again, most of it consists of mind games rather than games of physical strength. If you're in the mood for a pre-Halloween puzzle box of a book, this one may be for you. Rating: 3.5 of 5 Stars for a great rendition of fae politics and religion! Age Advisory: Ages 18+ for violence, murder, and sexual elements. I love the cover! The religious angle is off-putting, I admit, but otherwise this one sounds interesting. 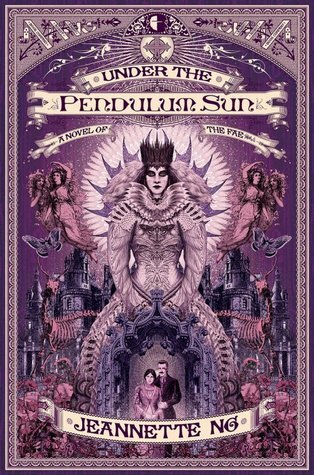 Yes, the cover is incredible- I love that it almost looks like lace because it's so intricate. I know some people prefer no religion in their books, and since this one has a heavy dose I thought I'd mention it. It seems to be a standalone and ended like one, but I wouldn't discount the author changing her mind. Thanks for stopping by and commenting, La La!